February is Black History Month. Picture books are a great way to introduce students of all ages to the contributions and achievements of Black Americans to our shared national history. This month we will highlight books from the LitART Curriculum along with LitART teaching tips. Each selected title delivers a unique presentation of an event, person, or place essential for understanding black history. 28 Days by Charles Smith. 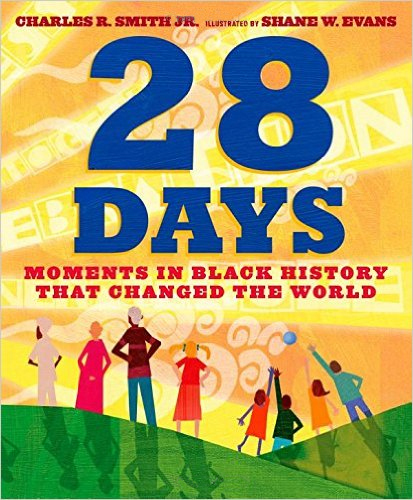 A great book to kick-off Black History month because the book features a different person or event in African-American history for every day of the month. Play the LitART 28 Days Partner Match Game. Give each student a LitART 28 Days card. When you say Black History Month, invite students to find the partner student who has the card with the matching definition/description of the person or event to their card. Use LitART’s award-winning collection of graphic novels, poetry, biographies, magical realism, historical accounts, and contemporary realistic fiction as starting points to engage students into deeper explorations of the racial disparities and structural barriers that still exist for African Americans today.